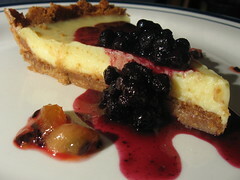 Key Lime Pie with Wild Blueberry Compote - Do You Know The Muffin Man? Notes: I couldn't find passion fruit puree so I just skipped the coulis. To get a half cup of key lime juice, you need almost an entire mesh bag of fruit (over a dozen). The recipe for the graham crust makes too much, so the crust is pretty thick; I also should have dissolved the granulated sugar in the butter. For the compote, I added a pinch of cloves. I'm indifferent about the pie, as it has a lot of sugar to balance out the acidity, while the condensed milk contributes a strong dairy flavour that is unappealing.